The breakout military SF series continues! Their spies were among us for years. They mapped our electrical infrastructure, learned our weaknesses, until finally they flipped the switch and threw us back into the Dark Ages. Only OMBRA and its battalions around the world seem capable of defending Earth from the next wave of attack—terraforming. But at what price can we gain our freedom from these yet to be identified aliens? They're pushing the human race to the edge of extinction if we can't find a way to change things. But what will we have to change? What will we humans become to survive this threat. This is a time for heroes. For killers. For Grunts. Benjamin Carter Mason will be asked this question over and over as he dives deep into the nasty heart of an alien transformed Los Angeles. And in the end, he might be the last person on Earth defending not just our lives, but our humanity. 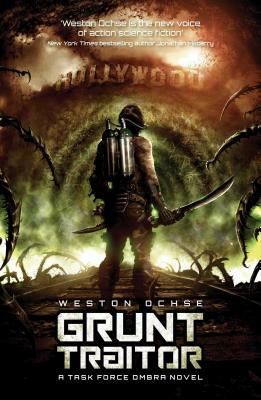 Weston Ochse is the author of ten novels, most recently SEAL Team 666, which the New York Post called 'required reading', and the military SF hit Grunt Life. His first novel, Scarecrow Gods, won the Bram Stoker Award for Superior Achievement in First Novel and his short fiction has been nominated for the Pushcart Prize. His work as appeared in comic books, and magazines such as Cemetery Dance and Soldier of Fortune. His work has been lauded by Joe R. Lansdale, Peter Straub, Kevin J. Anderson, John Skipp, Brian Keene, Jonathan Maberry, and many more, including the New York Times, New York Post, Washington Post, Denver Post, The Financial Times of London, and The Examiner (UK). His last name is pronounced "oaks." Together with his first name, it sounds like a stately trailer park. He lives in the Arizona desert within rock throwing distance of Mexico. For fun he races tarantula wasps and watches the black helicopters dance along the horizon.